Netflix may be spending all of the money to acquire new projects, but damned if they aren’t purchasing some fantastic stuff. Their latest high-profile acquisition? The Coens’ Western miniseries The Ballad of Buster Scruggs. The hotly anticipated anthology series will include six, stand-alone episodes about the American West, with Tim Blake Nelson starring as Buster Scruggs. For a taste of what we may get, you can check out their fantastic remake of True Grit, if you haven’t already. 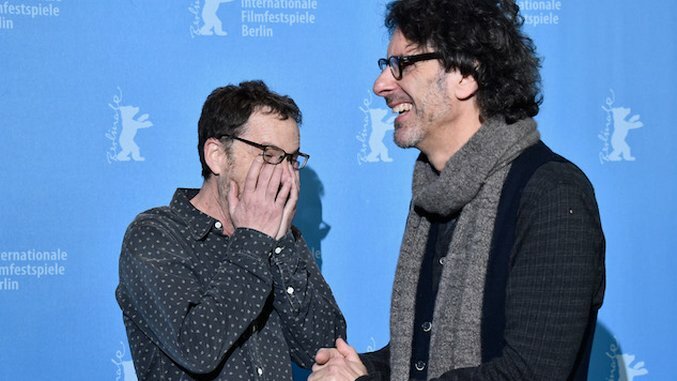 According to Netflix’s announcement, the Coens, who will write and direct the project, kept their thoughts on it succinct and to the point, exclaiming (presumably in unison), “We are streaming motherfuckers!” Without the comma, we are to assume that the Coens are just super pumped to not only be cinematic motherfuckers, but also streaming motherfuckers—motherfuckers who stream, as it were. No matter what sorts of motherfuckers they are, we can’t help but be extremely excited by the prospect of watching the Coens’ latest creation from the comfort of our motherfucking couches. The Ballad of Buster Scruggs is due out in 2018. Find out more about the show in our previous coverage here.